Bivalves are laterally compressed mollusks enclosed within a pair of hinged shells or valves. The valves are closed by the adductor muscles. The shell is opened by relaxing these muscles and water currents are drawn into the cavity. In the majority of bivalves the gill is modified for filter feeding, although the earliest bivalves may have been deposit feeders. Some bivalves retain this feeding strategy. Most forms are capable of limited movement and the foot can protrude into the sediment to enable them to burrow (Fig. 9.4). Bivalves are superficially similar to brachiopods, but have a very different internal anatomy and the shell is usually symmetric between the valves, rather than across the valve as in brachiopods (see Chapter 6). Bivalves originated in the early Cambrian and have diversified, particularly after the end-Permian extinction, to exploit a wide range of aquatic environments. They are characteristic of Mesozoic and Cenozoic shallow water assemblages. Most bivalves are marine but there are some freshwater forms. As the shell forms of different species are adapted to the nature of the substrate, bivalves are very useful in paleoenvironmental reconstruction. Fig. 9.4 Bivalve morphology: (a) general interior of a valve (right valve), (b) general exterior of a valve (left valve), and (c) internal morphology. Arrows show water currents in the mantle cavity. Table 9.3 Types of bivalve dentition. Bivalve shells are multilayered. Two phases comprise the shell - an organic matrix and a crystalline calcareous component, in the form of aragonite or calcite (CaCO3). Distinct shell structures have been identified that may be linked to the mode of life, for example burrowing bivalves possess a shell structure that is resistant to abrasion. Environmental factors such as water temperature may also affect shell mineralogy. The two halves of the bivalve shell are joined by a ligament that holds the valves in tension, allowing the shell to open when the adductor muscles relax. Teeth and sockets in the hinge area of the valves interlock to insure a tight fit when the shell is closed. Several patterns of dentition exist in bivalves, and this is a useful characteristic in classification. The main types are shown in Table 9.3. The earliest bivalves are known from Lower Cambrian rocks. These primitive forms are extremely small and may be descended from an unusual group of primitive mollusks called rostroconchs. Although superficially similar to bivalves, rostro-chonchs have a bilobed shell, without a functional hinge line. Strangely, no bivalves are recorded from the Middle and Upper Cambrian. A major period of diversification occurred in the early Ordovician. Groups arose with taxodont, dyso-dont, and heterodont hinges and a range of feeding strategies. Deposit feeders, byssally attached bivalves, and burrowers colonized marginal and nearshore environments. After this rapid radiation the group stabilized and bivalves were not a particularly diverse or abundant group during the Palaeozoic. Non-marine bivalves appeared in the Devonian and were abundant in the Carboniferous, particularly in deltaic environments. During the early Mesozoic, bivalves underwent a second radiation. The presence of a muscular foot and the development of siphons, by the fusion of the posterior edge of the mantle, gave bivalves an evolutionary advantage over bra-chiopods, allowing them to successfully exploit an infaunal mode of life. Predation pressure increased in the Mesozoic and bivalves were able to feed effectively from the secure position of a burrow within the sediment. By colonizing new infaunal environments, bivalves expanded into the intertidal zone, burrowed deeper into the sediment, and developed mechanisms for boring into hard substrates. Lutraria forms a body cavity for the whole animal, while the other valve is much smaller, is often flattened, and functions as a lid. The most important of these groups were the rudist bivalves. They colonized carbonate shelves, adopting conical forms similar to corals or encrusting or lying on hard substrates. This group was short lived, originating in late Jurassic times and becoming extinct at the end of the Cretaceous. Apart from the more bizarre groups, such as rudists, most bivalves survived the end-Cretaceous mass extinction. Bivalves have been ubiquitous in most shallow marine environments throughout the Cenozoic and they continue to be abundant in most present-day marine environments. Bivalves have adapted to live in a wide range of marine and freshwater environments. As shell shape is constrained by function, the mode of life of bivalves can be interpreted from the shell morphology. The major life habits of bivalves are: (i) burrowing in soft substrates; (ii) boring and cavity dwelling; (iii) attached (cemented or by byssus threads); (iv) unattached recumbant; and (v) intermittent swimming. 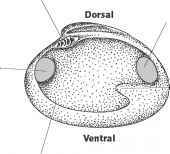 Bivalves that burrow in soft substrates tend to be equivalved and have a distinct pallial sinus (Fig. 9.5). Burrowing is achieved by the foot, which penetrates the sediment and swells. The muscles in the foot then contract, drawing the shell down through the sediment. Circular, heavily sculptured bivalves tend to burrow more slowly than smooth elongate forms, although the nature of the sediment also affects the speed of burrowing. Most burrowing bivalves are siphonate. During burrowing the siphons are closed. Some infaunal species are deposit feeders. Bivalves that bore into hard substrates typically have elongate, thin shells that are resistant to abrasion (Fig. 9.6). The shell edges are used to penetrate the material aided by acid secretions from the mantle. Some wood- or rock-boring bivalves have spines that scrape the substrate as the bivalve rotates. Some bivalves squat in borings made by other species. These bivalves grow to fit the cavity shape. Fig. 9.6 Bivalves living in hard substrates. 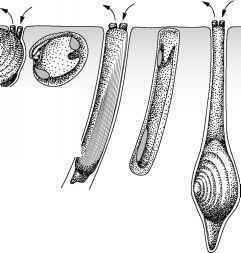 Epifaunal bivalves exploit three living strategies: (i) attachment to the substrate by byssus threads; (ii) cementation to hard surfaces; and (iii) recumbent, free lying on the sediment surface stabilized by the shell morphology (Fig. 9.7). Byssally attached bivalves secrete threads of collagen that adhere to the substrate. Typically, shells are elongate with a byssal gape, or notch. The anterior end of the shell and anterior muscle scar are usually reduced. Cemented bivalves produce a calcareous fluid at the mantle margin that crystallizes, fixing the bivalve firmly to the substrate. Shells of cemented bivalves are usually inequivalved. Often there is only one large adductor muscle scar. 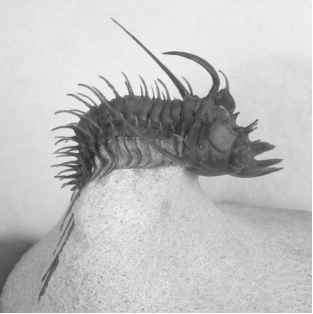 Tropical cementers are usually covered in spines. 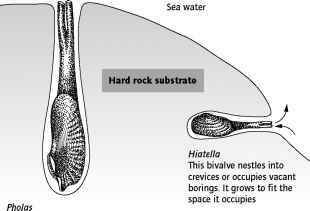 As the bivalve grows it accommodates to the irregular surface on which it sits. This results in an irregular shell form that is characteristic of this life habit. Recumbent, unattached bivalves have extremely asymmetric valves. Usually the lower valve is thickened, to increase stability, whilst the upper valve is reduced to a flat "lid". Bivalves that are able to swim do so only intermittently. The shells of swimming valves tend to be thin, to reduce weight, although some forms have pronounced radial ribs. There is only one large adductor muscle scar. A single large muscle provides the strong contractions needed for swimming. Two pronounced "ears" are present, either side of the umbo, extending the hinge line. The umbonal angle in swimming bivalves is greater than that of byssally attached forms with a similar shape. Where are bivalve mollusks descended from? Which phyllum of fossil come under the category infaunal? What does pallial sinus indicates about life mode of bivalve? What is the mode of preservation for this pecten and venus bivalves? Are thick shelled bivalves nearshore dwellers? Do large teeth and sockets in bivalves help to keep a bivalve shell closed? Which group of bivalves burrow through sand and mud?